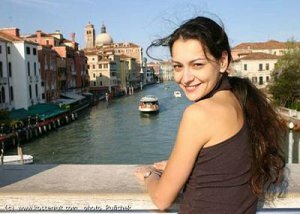 Alexandra Kosteniuk is a Russian chess Grandmaster with a FIDE rating of 2523, presently ranked eighth in the women chess world (according to April 2008 FIDE rating list). Her most notable chess achievements include: winning the Women's European Chess Championship in 2004, winning the Russian Women's Championship with 9/11 score and a performance rating of 2691 in 2005, winning the first Chess960 (Fischer Random Chess) women world championship beating Germany's top women chess player Elisabeth Pahtz in 2006. Kosteniuk has been promoting chess in the capacity of a fashion model and ambassador of chess in order to spark interest in the game around the world. Apart from chess, she is actively involved with writing poems, books and articles. She loves to do fashion modelling and even has played a part in a movie, which she considers the most fun thing she has ever done in her life. 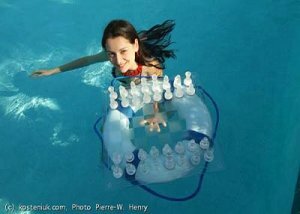 LatestChess: Hello Alexandra, We are glad to have you on LatestChess. Most of our readers are, of course, familiar with your great chess career, but you also pursued a concurrent career in fashion modeling. It must be hard to manage both the activities? GM Alexandra Kosteniuk:Thanks for inviting me to LatestChess! To answer your question, really it's not so hard, as mostly I play chess. I consider the fashion modelling only like a hobby, and I do it only to promote chess. I always insist that the magazines that invite me to model for them write an article about chess, I want more people to know about our wonderful game. There are practically no photo shoots where the readers don't know that I am a chess player, it's very important to me. I think the modelling helps chess as people find out that beauty and brains can go very well together. LatestChess: You have undoubtedly an important role to play in promoting chess as an icon for a younger generation in Russia and all over the world. What role do you see yourself playing in the future? GM Alexandra Kosteniuk: Especially now that I have a little baby daughter, I see my role as teaching chess to kids, showing them that chess is a great game that can help them in their life, first at school, then succeeding in life. LatestChess: You are actively involved with writing poems, books and articles. It’s amazing to see your involvement in so many fields other than chess. But these activities must have consumed a lot of your precious time; do you think you could have been a much stronger chess player if you would have concentrated only in chess? GM Alexandra Kosteniuk: I don't think it is good for a person to be focused only on one thing, it is important to be well-rounded. One needs to be balanced, and very healthy both physically and mentally. Then one needs to complement one's passion by knowledge and hobbies in other fields. It's a way to be happier in life. I may have been stronger if I had only played chess, but would I have been happier? LatestChess: In August 2006 you became the first Chess960 (Fischer Random) women world champion, could you tell us about your views on future for Fischer Random chess? GM Alexandra Kosteniuk: I absolutely love Fischer Random Chess (Chess960), it's a great invention of Bobby Fischer, it allows us to start playing chess from move 1 on. One thing I don't like about chess preparation of Grandmasters nowadays is the enormous amount of time one needs to devote to opening preparation. In Fischer Random you need to use your brains from the very beginning, the games become immediately interesting and unusual. Fischer Random favors the better player, the one with more imagination and better calculating skills. I am looking forward to defending my title in Mainz in August 2008. LatestChess: What could be the reason that makes Judith Polgar different to other girls, who cannot make it to 2700 or over? GM Alexandra Kosteniuk: Judith is clearly very gifted, and she has worked a great deal from a very early age. Also the fact that she has insisted on playing exclusively in men's tournaments has raised her level, and it's all to her credit. LatestChess: Russian's have added chess as a subject in the Schools; do you think Chess can be used as a powerful educational tool? GM Alexandra Kosteniuk: Chess is a most useful tool it has been proven many times. It improves memory, stimulates logical thinking, and helps to show kids that the world is quite a competitive place, either you win, or your neighbor will. It is also great to show that the more you work at chess, the better you will become. That is valid for anything in life. LatestChess: Parents tend to invest a lot in their kids chess careers, and it seemed that they placed undue emphasis and pressure on their kids. What should be the role of a chess parent be in their child's life? GM Alexandra Kosteniuk: First of all, a parent should make sure their kids are happy. They should never force their kids to do anything the kids absolutely don't want to do. It is however good if a parent tries out their kids with different sports or games or musical instrument to see what suits their kids best. If their kid likes something, it's great to show them the way to become better, but without putting too much pressure of course. Childhood should be the happiest moment of anybody's life! LatestChess: Most of the world champions came from Russia, What could be the reasons? What qualities make Russians dominate the chess world? GM Alexandra Kosteniuk: I think it's the fact that in the Soviet Union chess was so highly viewed, so many kids started to play chess, there were so many chess schools that selected the most gifted kids and gave them top trainers. Chess Grandmasters were heroes and so everybody dreamed of becoming one and worked a lot on chess, creating the famous Soviet Chess School. I think in general the whole world has very gifted people, it's partly a numbers game, and partly a good teaching system. LatestChess: As one of the most prominent women in the world of chess, have you experienced sexism, and if so, how have you combated it? GM Alexandra Kosteniuk: Not really, in chess, nobody cares if you're a woman or a man playing chess. Men Grandmasters play against me not personally, but against the chess pieces I move on the board. If I happen to be the only woman in a tournament, of course I feel I have to do my best against the men, but I would do the same if it were all women. LatestChess: Apart from chess, you have snagged attention with your good looks, your glamorous photos on magazines, modeling with a new chess uniforms etc. Do you think glamour can help in popularizing chess world wide? GM Alexandra Kosteniuk: Glamour can help to attract people to chess. Many people think that chess is boring, and parents may not want their kid to be like they perceive like a boring chess player. So when they see an article that shows me being a "normal" girl, looking "normal", and having time to play chess, they think "Hey, I think if my daughter was like this girl it would not be so bad", and so that's good for the image of chess. LatestChess: What are your future plans, any plans of starting your chess center or doing more activities? GM Alexandra Kosteniuk: I work a lot to promote chess in the world, apart from playing in tournaments, I visit schools to give lectures, I play lots of simuls. I love to play blitz and rapid games, I try not to miss any good such tournaments. Together with my Mom we have started 2 years ago a chess school in Moscow for children from 3 to 7 years old, and it's very successful, I'm very happy about it.